Anyone familiar with Frida Kahlo’s paintings knows she puts herself front row centre. Self-portraits have a dreamlike quality, a Technicolor palette and a no-holds-barred confessional feel that Tracey Emin would be proud of. Kahlo’s distinctive look – dark hair piled on top of her head, chunky earrings, a cluster of flowers, an unapologetic unibrow and a visible moustache – became part of her story. Added to that was a flair for style: she dressed in tweaked versions of traditional Mexican clothing. A kind of corset-style bodice and long flowing skirt, both in vibrant colours and covered with rich embroidery, was a signature silhouette. What she wore contrasted with the sleek aesthetic of the dominant fashion of the 1930s and 40s and she stood out on purpose. As such, she has consistently inspired fashion designers – Jean Paul Gaultier, Marc Jacobs, Rei Kawakubo and Dolce & Gabbana included. 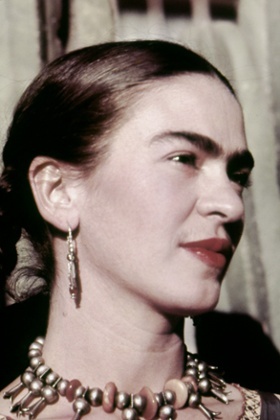 Kahlo’s deep connection to clothes was acknowledged by those closest to her. When she died in 1954, aged 47, her husband, Diego Rivera, locked up the room in which her clothes were stored, where they remained for 50 years. Now, a photographic record of more than 300 items can be seen at the Michael Hoppen gallery, London, from 14 May. Photographer Ishiuchi Miyako was invited to document them when they went on show at the Frida Kahlo museum in Mexico City in an exhibition curated by Circe Henestrosa which focused on the way Kahlo built her identity through disability and ethnicity. 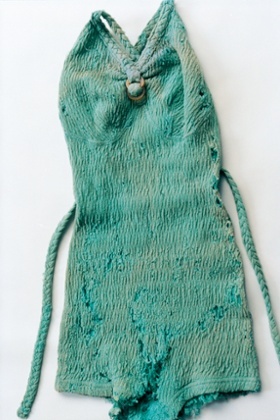 His closeup shots reveal the the wear and tear of clothes that were loved and worn. Included are a sunbleached swimming costume, cat’s eyes sunglasses and darned stockings, as well as those embroidered dresses that have become so associated with Kahlo. 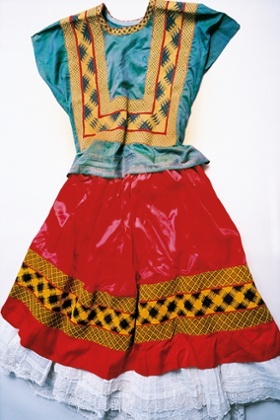 Originally worn by women from the Tehuantepec area of Mexico, where there is a matriarchal society, the traditional dresses were adopted by Kahlo as a symbol of strong women. She also wore intricately embroidered Huipil blouses, part of the Mayan tradition, where each pattern on a blouse, typically worn for 30 years, tells the story of the wearer. Like those blouses, Miyako’s images show that Kahlo’s clothes have a richness way beyond their face value. Her style and life are intertwined – she loved clothes for how they made her look and feel, but she also used them to both mask and highlight aspects of her identity, after childhood polio and a bus accident at 17 left her with life-long health problems and physical ailments. Kahlo famously began painting during her first three-month spell in hospital, and clothes were centre stage from the start – an early painting is titled Self-Portrait in a Velvet Dress, and she often painted on the body casts she had to wear for long periods. The blouses and Tehuantepec dresses were not just aesthetic or a way to express pride in her Mexican heritage. They were used to hide imperfections in her lower body left by the accident that nearly 40 operations couldn’t correct, but also to tell of her experiences – the corset-style tops were flattering and also reminiscent of the body casts. The more incapacitated Kahlo became, the more colourful and attention-seeking the outfits were. Particularly striking is an image of the prosthetic leg she had to wear after an amputation in 1953. In typical Kahlo style, it’s dressed flamboyantly: in a red embroidered boot, with a bell on the laces. It is creative reactions such as this – only a year before her death – that make Kahlo such an intriguing example of a woman using clothes in extraordinary ways, refusing to blend into the background whatever life threw her way. As a result, more than 60 years after her death, she’s that rare thing – a bona fide fashion icon. Long may her influence reign. • This article was amended on 12 May 2015 to include a reference to an exhibition at the Frida Kahlo museum in Mexico City curated by Circe Henestrosa.